Summoning the boldness of austere taste and sophistication, Euro Moderno shows how striking forward-looking design can be. 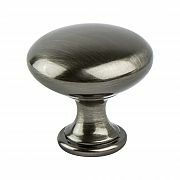 Featuring smooth effects on its designs, like this knob, this collection will add a smart accent to virtually any design style. Note: This product is also known as 97231BBNP, BQ97231BBNP on other websites.